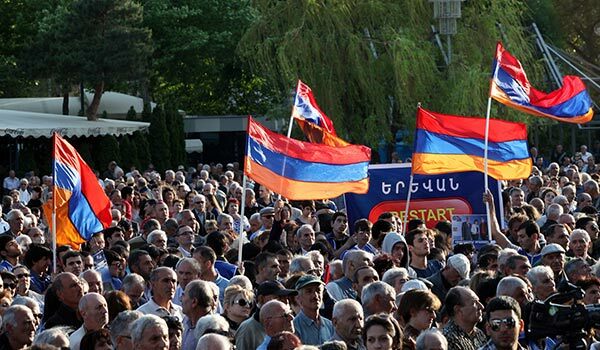 Major opposition forces participating in the May 5 elections to Yerevan’s Council of Elders rule out the possibility of the current ruling Republican Party of Armenia (RPA) and its mayor Taron Margaryan retaining power in the Armenian capital. Under the election law that pertains to the Yerevan municipal vote, a political party, or a bloc of parties, that manages to receive more than 40 percent of the vote will automatically have its top candidate installed as mayor. If neither party or bloc can get that majority, the decision will be collectively upon the newly elected Council of Elders. Earlier this week the opposition Armenian National Congress Party (ANC) turned to the Prosecutor-General’s Office, asking it to inquire into the legality of the wealth officially declared by 35-year-old mayor Margaryan and worth several million dollars. The ANC wants prosecutors to find out whether the incumbent mayor used any levers of power in the acquisition of the property that he officially declared to be the owner of. Representatives of the RPA have dismissed such statements by the opposition leader, insisting that Margaryan has been one of the most, if not the most, popular mayor of Yerevan ever and has deserved reelection due to his hard work praised by many residents of the capital. They also consider it normal that Margaryan, the son of late Prime Minister Andranik Margaryan and former popular prefect of the administrative district of Avan, should be in possession of such property. “Unfortunately, the authorities realize the gravity of the moment better than many of the [other] parties. This is evidenced by their reverting to violence, terror, provocations, especially against ANC and Prosperous Armenia Party activists,” said Ter-Petrosyan. Several incidents have occurred during the current election campaign. In one of them an ANC activist was assaulted presumably by RPA loyalists while canvassing for his party in a Yerevan suburb. In another major incident a reporter with a pro-opposition paper covering an RPA campaign meeting was assaulted by one of the candidates of the ruling party. In Ter-Petrosyan’s opinion, an opposition bloc can be formed after the elections to prevent the RPA from reinstalling its mayor. But before that the opposition claims the RPA will try to rig the vote to secure the number of seats in the 65-member body required for the automatic election of the mayor. In particular, one of the allegations is that non-residents of Yerevan will be brought to the capital on Election Day to vote. Under law, citizens who are not registered in Yerevan but live in the capital for at least three years can also take part in the vote. Some experts believe the authorities may try to benefit from this legal provision by having loyalists from the regions participating in the vote. At a rally on May 1, Raffi Hovannisian, a former presidential candidate and leader of another opposition party, Heritage, which is contesting the May 5 elections as part of the Hello Yerevan bloc, said that a new situation will emerge in the country after next Sunday’s elections and that this situation will be unimaginable without Hello Yerevan. Hovannisian, whose finish with 37 percent of the vote in last February’s presidential election came as a surprise to a great many political observers, spoke of another surprise in store for the government on May 5. “The government will not last for another 5 years… and after May 5, Taron Margaryan, the son of Andranik Margaryan, with all due respect to him, will not be the mayor of the capital,” said the opposition leader. Meanwhile, the Prosperous Armenia Party, which calls itself an ‘alternative’ rather than opposition yet, continues an active campaign, confident of the outright victory of its top candidate, former Minister of Foreign Affairs Vartan Oskanian. While many experts still see a possibility of PAP leader Gagik Tsarukyan striking another coalition deal with President Sargsyan after the Yerevan elections, several representatives of PAP have ruled out the possibility of the party’s returning to the RPA-dominated government.